For the past five years, safety has been a big focus for BrightView when it comes to outfitting its vehicles. BrightView and its predecessors have studied the best truck and trailer setups for years, according to Tim Russell, vice president of operations for the Plymouth Meeting, Pa.-based national company. Today, the company has boiled down its preferred rigs to a few setups. The first option, which is a “small percentage of the fleet,” is for crews that operate in cities. These are either box or landscaper body trucks with no trailers. “They’re not hooked to trailers because it’s tough to get around in densely populated areas with a trailer,” Russell says. The nonurban options are either a F250 pickup truck with a trailer (open or enclosed) or a stake body dump truck with an enclosed trailer. Which type of truck a BrightView crew gets depends a lot on its region. BrightView works with trailer manufacturers to install equipment racks and storage systems in its enclosed trailers, so it’s easy to find and not damaged in transit. The trailers are arranged so everything has a designated, secure place and nothing is damaged in transit. BrightView is intentional about their design, Russell says, noting the company works with the trailer manufacturer to install the racking and storage systems. As for equipment choices, it varies by branch, Russell says. BrightView has national agreements in place with several brands in each equipment category, and it’s up to the branch to make the choice. “Generally, the branch tries to stay within the same manufacturer because it doesn’t make sense to have multiple mower brands in one branch,” he says. For the past five years, safety has been a big focus for BrightView when it comes to outfitting its vehicles. This attention has prompted some changes, such as adapting trailers to fit coolers for crews to always have water on hand and having a spot for safety cones accessible from outside, so crews can deploy them as soon as they stop. “It’s pretty straightforward, but when you really boil it down, it’s making sure everything has its place and is in there safely,” Russell says. 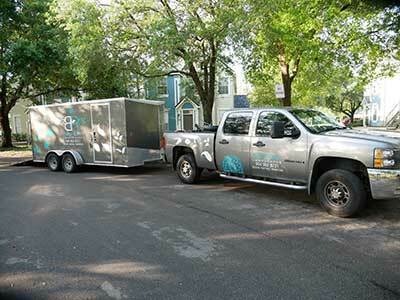 Beach River Landscapes favors enclosed trailers for their marketing ability. In Jacksonville, Fla., Wally Wood, who co-owns Beach River Landscapes with his wife, Leah, runs two trucks. His preferred setup for landscape maintenance is a Chevy Silverado 2500HD with a 7-foot by 16-foot V-nose trailer. The key to a smooth operation, Wood says, is being organized. 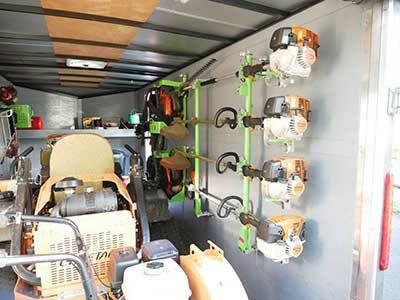 He credits his trailers’ organization to equipment racks from Green Touch Industries. 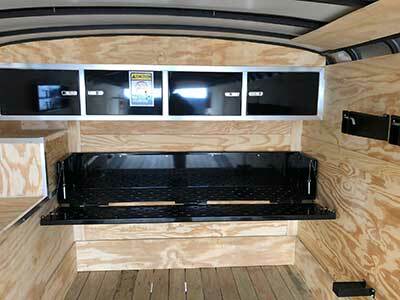 Beach River Landscapes’ trucks include locking racks, keeping the equipment organized and secure. Wood, who runs Scag mowers and a mix of Stihl, Husqvarna and Echo handheld equipment, says he also loves that the racks all lock. He secures his equipment even though it’s in an enclosed trailer. Theft is a major concern for him, as a small business owner. Finally, he favors the enclosed trailers for their marketing ability. “We hear a lot, ‘If your trailers look that good, we assume your work is going to be good,’” Wood says.